Research from two UC San Diego economists shows that the economic forces that push and pull people across borders are changing such that the border wall could be a moot barrier before it is even finished. President Donald Trump swept into office on a platform whose most clear plank was a promise to “build that wall.” As president, Trump has taken swift steps to make good on the promise – the government is already soliciting design proposals for the project. While this might have been a handy campaign slogan, the economic forces that push and pull people across borders are changing such that the wall could be a moot barrier before it is even finished. Any proposal to finish building a wall along the U.S.-Mexico’s border assumes that immigration from Mexico has always happened in large numbers and always will. Previous attempts to build barriers under Presidents George W. Bush and Barack Obama — whether physical or virtual — have been prohibitively expensive and primarily succeeded in pushing illegal crossings further into the borderland deserts. As the U.S. prepares to invest tens of billions of dollars in Trump’s project, it is worth asking whether immigrants from Mexico are likely to continue coming north at the same rates, particularly given research showing that economic considerations weigh most heavily among people choosing to immigrate. In fact, there is good reason to expect that the flow of immigration from Mexico is about to drop sharply – wall or no wall. Indeed, while it might seem like large volumes of Mexican immigration are a foregone conclusion, the flow has not always been as large, and is expected to fall sharply in the near future, as presaged by the declining rate of border crossings since 2007. 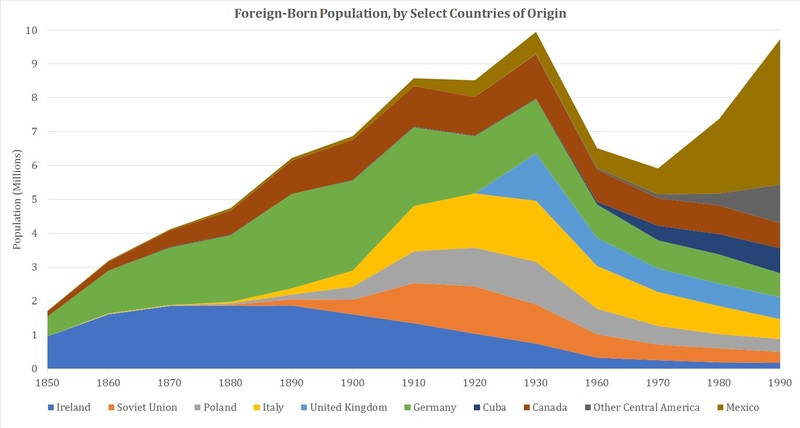 Craig McIntosh and Gordon Hanson, two economists at UC San Diego’s School of Global Policy and Strategy have been studying global flows of immigration for the past decade. They recently published an article in the Journal of Economic Perspectives forecasting an even steeper decline in immigration from Mexico. Their argument is built on demographic trends, and they note that the sudden end of the U.S. baby boom in the 1960s was followed 20 years later by a decline in the growth of the domestic labor force. By the 1980s, the U.S. economy was growing more than its labor force, creating a pull factor for labor. At the same time, Mexico’s birth rate had not yet declined, which meant that the labor force population in Mexico was surging in the 1980s just as the U.S.’s began to lag. Naturally — at least to economists — the labor supply moved to where it was demanded, and so began the movement northward. Concurrent with this labor force surplus in Mexico, the 1980s were its “lost decade,” when macroeconomic instability saw Mexico default on its loans, suffer from enormous inflation and lack of investment. Mexico’s economy tanked and stuttering growth translated into strong push factors. In other words, unless the U.S. scuttles Mexico’s recent economic growth, demand for labor there would begin to exert a much stronger “pull” on Mexican workers. Indeed, the most effective thing the U.S. could do to dampen the flow of immigration would be to invest in Mexico’s economic health. Few cities are as affected by Mexico’s economic health as San Diego. With strong manufacturing and innovation in clusters like audio/video equipment and medical devices, which span both sides of the border, a hit to one side of the CaliBaja megaregion will cause turbulence everywhere. For example, numerous firms have research operations based in San Diego, with manufacturing just across the border in Tijuana. “Tariffs” and “border taxes” may seem like abstract buzzwords in a D.C. debate, but these could have profound and immediate effects to many industries in San Diego. Nonetheless, it seems very likely that the Trump administration is going to spend a lot of taxpayer money in an attempt to remove much of the Mexican immigrant population from the U.S. In their research, McIntosh and Hanson also consider a country that has kept immigrants out: Japan. As an island nation, with policies that make it very difficult to immigrate, Japan provides a glimpse into a possible economic future for the U.S. In December, the Japanese government hosted a group of UCSD students to highlight economic ties between the two countries, showing off numerous state-of-the-art, highly automated car part factories with the occasional human worker sprinkled in. But Japan is harbinger for the developed world, with an age distribution that skews heavily upward, and a birth rate so low that total population peaked in 2010 and has been shrinking ever since. Japanese officials recognize the need to fill the fast-increasing labor vacuum, but increasingly their options are limited to robots or immigration. There will soon be much less pressure “pushing” the labor force out of Mexico, which means the U.S. might be about to have a shiny, new and very cost-ineffective wall. These predictions are predicated on a major assumption, however: that the U.S. not torpedo Mexico’s economy. The U.S. has already withdrawn from the Trans Pacific Partnership trade agreement, and with the North America Free Trade Agreement in its sights, this could be a faulty assumption. Signed in 1994, trade with the U.S. alone under NAFTA makes up over 81 percent of Mexico’s exports, and because Mexico has suffered due to exposure to Chinese manufacturing, TPP was expected to marginally help improve its competitiveness. Ironically, a protectionist policy agenda that increases barriers to trade to ostensibly support American workers could simply pile on the push factors for potential immigrants in Mexico. Kyle D. Navis is a graduate student of international affairs at UC San Diego. Before coming to San Diego, he worked for an aid/development nongovernmental organization in Bolivia and was a Teach For America corps member in Philadelphia.